It’s a capitulation. It’s the end of Bitcoin. It’s a Bitcoin Sell-off. And it’s true; a typical Bitcoin investor is bleeding right now. 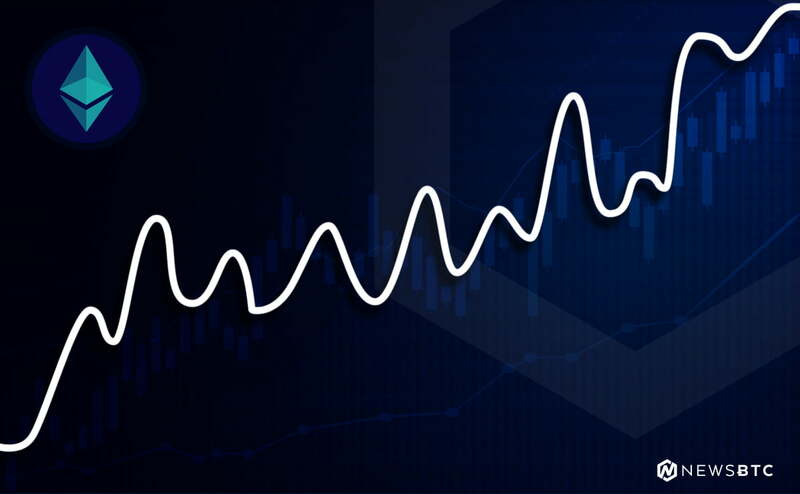 But a critical look at price action and historical price movement paints a rosy picture: Prices will most likely recovery and print higher in the next few months. I'd like to process a refund? I think the man's name is Satooshi Nakomoku? They often do and the bounce back stronger is usually stronger than before. The cryptocurrency market is after all a 10 year old space embodying the spirit of the Cypher-punks. Bitcoin and cryptocurrency represent freedom and freedom from government involvement and deliberate steps as money printing that cause hyperinflation read Venezuela and others. The value of freedom reflects in Bitcoin and as it has been the case, freedom is expensive and Bitcoin can’t be cheap. Looking at historical prices it is clear that BTC has been on an uptrend and price movements seem to move in cycles. Three years after inception and limited adoption, BTC prices surged from 30 cents to $4.20 in an apparent Chinese pump that put Bitcoin on the spot. The following year—in 2012, prices expanded from $4.2 to $13.51 by close in a 186 percent gain repeating the same in 2013 when BTC raced from $13.51 to $758 in a 5507 percent gain. In these three years, average gains were 2,388 percent. But, even at the back of these stellar gains, BTC/USD prices fell sharply to $320 by close of 2014. That’s a 58 percent drop thanks to Mt. Gox mayhem. However, this didn’t damp expectations and in the next three years—from 2015 to close of 2017 prices shot from $320 to $13,860. 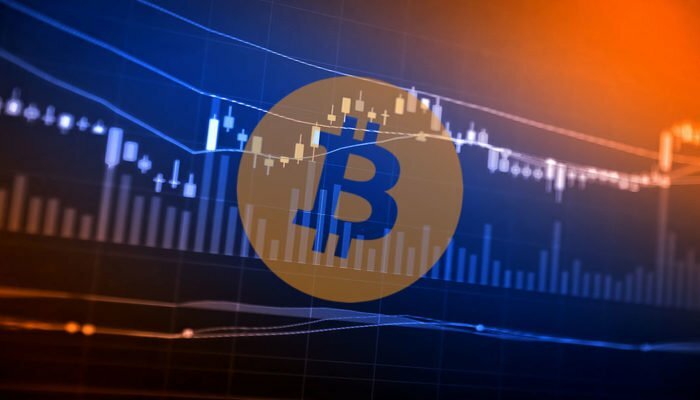 In these three years, average gains were exponential—adding 35 percent in the first year, 125 percent in the second year and the final boom of last year when BTC closed at $13,860 saw gains of 1,331 percent. Compared to 2014, 2018 Year to Date losses is at 59 percent. As you can see, yesterday’s meltdown is just part of a larger cyclical plan. Like Zhao Changpeng, it is likely that Bitcoin bulls will dominate next year. But, for prices to rally, then price dips are inevitable. It’s in progress and for our cyclic price movements to hold true, it is likely that BTC will rally next year, slow down in 2020 and explode to super new highs—perhaps to $250,000 by 2021. At least that’s what history is hinting off. All we need is a catalyst and a Bitcoin ETF is what the market needs. So exactly where do we expect to find loading zone? When we take a top-down approach, it is clear that we do have a bear break down pattern. BTC/USD prices are now trending below $5,800 and printing new 2018 lows. 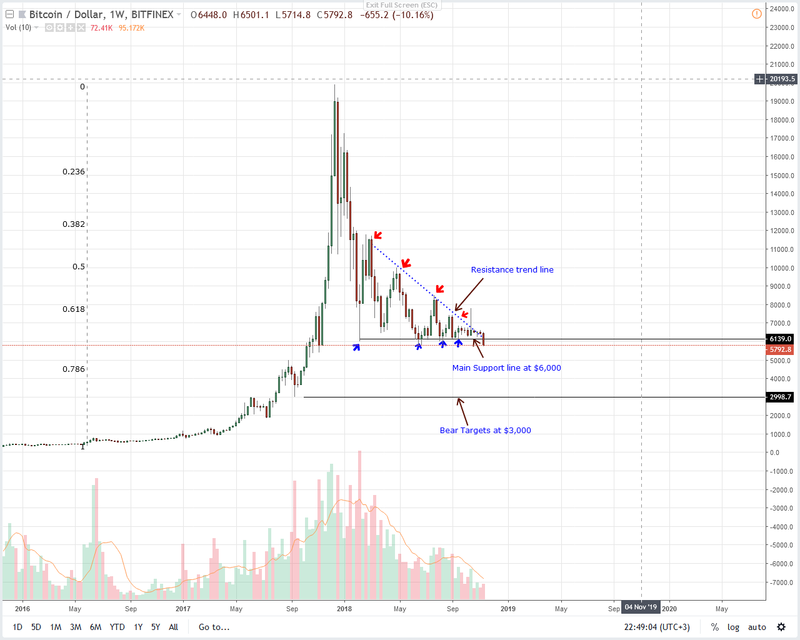 From the charts, there are two levels of interest, the 78.6 percent Fibonacci retracement level drawn from 2017 high lows at $4,500 and the next support level of $3,000. Like in our previous BTC/USD iterations, we said any break below $5,800 and bears should look to unload at spot with stops at $6,000 and first targets at $4,500. If losses are steep then $3,000 would test Bitcoin holders’ grit. From this, the $1,500 gap between these two important levels is where Bitcoin could spring back to $8,500 or higher.